Cruises that visit or depart from Athens sail to the Greek Islands and Mediterranean and a few visit the Black Sea or the Middle East. 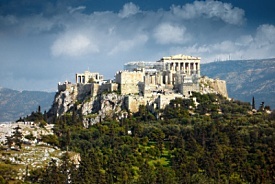 Athens also is a starting point for some trans-Atlantic repositioning cruises. Athens is considered the birthplace of Western civilization, and the Parthenon on the hill of the Acropolis is a prime stop on excursions. Visitors to the Acropolis can also view the Propylea (the entrance), the Temple of the Wingless Victory, the Erechtheion temple and the Acropolis Museum. A drive down Syngrou Avenue offers an impressive view of the Arch of Hadrian and the Temple of Olympian Zeus. The National Archeological Museum houses a rich collection of antiquities.